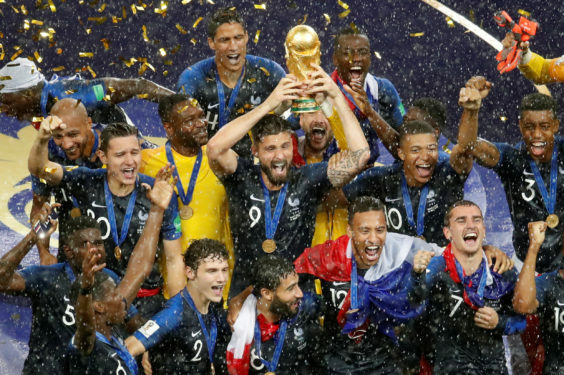 It’s a phrase that’s been shouted countless times this past week, as the French national men’s soccer team captured its second-ever World Cup last Sunday with a 4-2 victory over Croatia in the final match. From Luzhniki Stadium in Russia, to everywhere in France, to all over the world, the chants of “Vive la France” are still being heard loud and clear. Right here in our Diocese of Brooklyn, the chants are the loudest at St. Agnes-St. Paul in Carroll Gardens. Father Paul Anel, the priest in charge of the French-speaking community of the diocese, was born in the southwestern region of France – about an hour away from Lourdes along the Pyrenees mountain range. He came to the U.S. in August of 2008 and was ordained a deacon at St. James Cathedral-Basilica, Downtown Brooklyn, in 2009. The year after, he returned to France to be ordained a priest before being assigned to this diocese. His parents, two brothers and sister still live in France. Father Anel had been traveling during the start of this summer’s World Cup so he only began following intently during France’s semifinal victory over Belgium. He said he was very impressed with the team’s play. Each Sunday at St. Agnes, Father Anel celebrates the 10:45 a.m. French Mass. Since the World Cup final was played at 11 a.m., he was able to get in his last few prayers for the team before being able to enjoy the second half after Mass. Throughout the journey to World Cup glory, France remained humble in victory – a trait Father Anel found admirable, given the example the team set for youth soccer players across the globe. France last won the World Cup in 1998. Father Anel was still in the country at that time and clearly remembers the celebrations when the team won. “In France, the national identity is very weak,” Father Anel said. “To an American it might sound strange, but we never exhibit the flag. While the celebrations will surely continue for Father Anel and his compatriots, the Croatian team can hold their heads high after reaching the World Cup final for the first time ever. Among those celebrating the Croatian team is Father Vedran Kirinic, administrator at Most Precious Blood, Astoria, and coordinator of the Croatian Apostolate in the diocese. Father Kirinic was born on the Croatian island of Krk in the northern Adriatic Sea. His family moved the U.S. while he was still an infant, and he lived in the states for 10 years before going back to Croatia for high school and his ordination as a priest. After studying in Rome, he’s led the Croatian Apostolate from Most Precious Blood for the past six years. Father Kirinic was pleased with the team’s showing during this World Cup tournament, especially since the country only has 4.2 million people, compared to a population of 67 million in France. Until this year, the furthest Croatia had ever advanced in the World Cup was the semifinals in 1998, losing to eventual champion France. This time around, France once again proved to be too strong of an opponent. Father Anel may be the local priest celebrating at the moment, but Father Kirinic hopes Croatia builds off the success from this year to be poised for a championship run during the next World Cup. We’ll find out in four years, when the men’s tournament heads to Qatar in 2022.